I haven't set up any Christmas tree nor decoration! sob. I know, it's beginning to look less like Christmas at my home, why do deadlines come right on the jolliest season? Anyway, enjoy the second Christmas Tag Pals. Meet Angel, Ginger, and Elfie. If you are using this please do share your picture with the rest of babalisme's readers. Have a merry weekend! cute cute cute!! Thank you for spreading the christmas cheer! well done ! 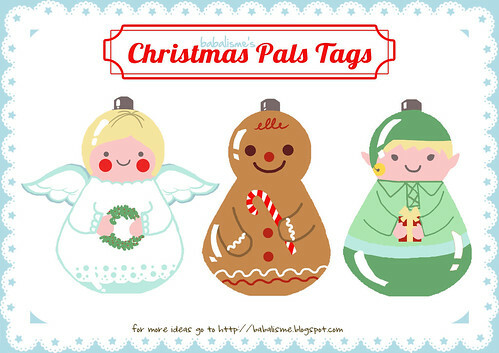 your christmas tags are very pretty ! Thank you so much for this post. I want to let you know that I posted a link to your blog in CBH Digital Scrapbooking Freebies, under the Page 5 post on Dec. 10, 2010. Thanks again. Oh it's cute!! Thank you! So sweet, thanks for sharing!! Thank you so much for the Jolly Pals! They are cuties! I love these! I linked to your tags and will be linking to your adorable paper dolls also. Your illustrations are so magical! Thanks so much for sharing:-)Hope you have a wonderful Christmas! I linked to your tags on my blog -thanks for sharing!